The premise of this collaboration between Aidan Baker and Claire Brentnall of Manchester-based purveyors of ethereal dark pop, Shield Patterns, is neatly summed up in the press release. It’s not an indication of lethargy to quote directly and at length but a recognition of the fact that a label or PR has the best handle on what it’s doing, and is every bit as capable of articulation as a journo. So much so, that there are those who also have a handle on the possessive apostrophe, for which respect is due. 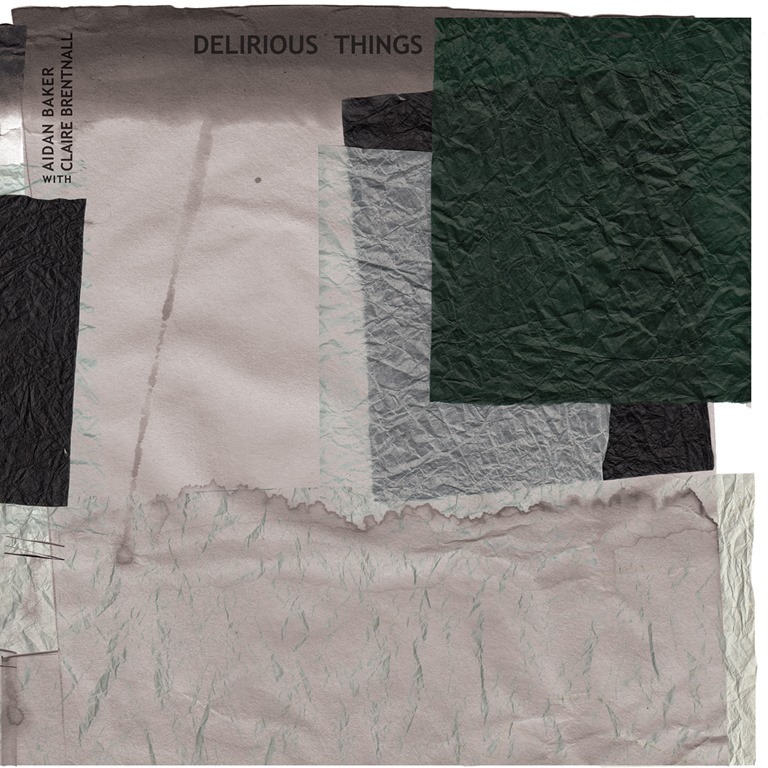 So, ‘Delirious Things is an exploration of Aidan Baker’s interest in 80s-influenced cold-wave, shoegaze, and synth-pop from such recording artists as Factory Records’ Durutti Column, Joy Division, and Section 25 and 4AD’s Cocteau Twins and This Mortal Coil’. It’s a curiously hushed, tempered work and it’s the overall sense of quietness which is its most striking feature. We live in a loud world. As I noted when reviewing Jeffrey Roden’s Threads of a Prayer – Volume 1, I find it increasingly difficult to find the time and space to listen to quieter, more contemplative music: the ‘noise’ of the fast-paced society in which we now live is no longer a metaphor, and it’s evermore difficult to find a moment’s peace, metaphorically or literally. I’m not in a position to offer empirical evidence to substantiate the correlation between the pace and volume of life with the increasing prevalence of mental health issues because I’m a) a lazy journalist b) too busy to invest time on such detours while researching album c) struggling with my own anxieties (aren’t we all in our various ways, whether we admit it or not?). All that said, it’s perhaps also worth noting that despite the bewildering quantity of releases I receive to review, either physically or digitally, the number of works which dare to explore such low volume registers are few and far between. This means that while often being barely audible in some settings, such releases stand out alone by virtue of their difference. But, significantly, Delirious Things also stands out on merit. Delirious Things is an album which is rich in atmosphere, but there’s something about it which feels uncomfortable and radiates a subtle but inescapable sense of discomfort. It takes a while to ascertain precisely what it is that’s awkward and vaguely discombobulating about it. Superficially, the songs are spacious, atmospheric dreamworks, th tructures loosely defined, the sounds partially abstract, the emotions they convey as fleeting and ephemeral as the recollection of the sensations and images of a dream on waking. There’s an icy fragility about the songs, and Brentnall’s breathy vocals – as much reminiscent of Cranes’ Alison Shaw and Toni Halliday of Curve as the common touchstones of PJ Harvey and Kate Bush – are captivating yet, at the same time, also subliminal in their power. Laid down in layer upon harmonising layer, her voice is everywhere, and drifts from every corner of the music and even the silence between the sounds. This is nowhere more true than on the album’s vaporous final track, ‘Shivering’, which delicately glides beneath the skin and brushes at the bones and the soft matter beneath. The funereal ‘Dead Languages’ has echoes of late Joy Division or Movement era New Order, and distils its sonic elements to a stark minimalism that’s spine-tinglingly powerful. Beneath the surface, ripples of tension radiate and currents of darkness surge, silently but powerfully. Baker utilises stereo panning to optimal effect and subtle details like a fractional lag between beats across the left and right channels are incredibly effective, particularly when listening through headphones (which is strongly advised, because it facilitates optimal appreciation of the detail, while also reducing the bled of noise from the outside world, be it the babble of work colleagues, the hum of the boiler or the whirr of the laptop fan: reducing extraneous interference is essential in order to absorb the meticulous detail of this album). There are fractional delays between some of the beats between the channels. The effect is barely perceptible, but nevertheless a tiny bit disorientating. Of course, once you’ve noticed this, you can’t unnoticed. It’s impossible to tune out. But tuning in and embracing the It’s when one begins to look closer into the album’s detail that its true magic discloses itself. On the surface, it’s a collection of quiet, calm, opiate-slow songs with a misty, hazy quality. How does this, and the referencing of the Cocteau Twins reconcile with 80s-influenced cold-wave, shoegaze, and synth-pop? Again, it’s in the detail: Delirious Things incorporates stylistic elements of all of the above, but reconfigures them, so, so carefully. The album’s success lies in the way it draws together recognisable genre trappings and familiar stylistic tropes and renders them in a fashion which is similar enough to be still familiar and yet different enough so as to be unfamiliar. What is different about this? you will likely ask yourself. In the mixing – the pitching of the beats way down in the mix, the way in which the sound is scaled down and paired back and stripped out of made for radio / iPod compression and exists with a very different set of production values. This gives Delirious Things a feeling of freshness, and ultimately renders it a triumph of artistic vision over commercial conformity.